It was standing room only as more than 50 people enjoyed a complimentary all-you-can-eat eat buffet at the Grand Opening of Angel’s Thai Café, located at 136 Monroe Center NW. 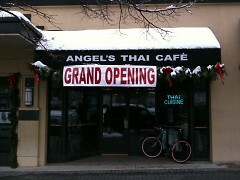 Angel's chef Ger Lee had previously indicated that the eatery was due to open by the second or third week of November. But after today’s 12:30pm ribbon-cutting ceremony, officiated by Grand Rapids mayor Reverend George K. Heartwell, the Thai-fusion Café became the newest addition to Monroe Center, an already popular lunchtime destination for area office workers. The restaurant, which occupies the longtime former home of Four Friends Coffeehouse, is owned by Lee’s sister Julie and her husband Lang. 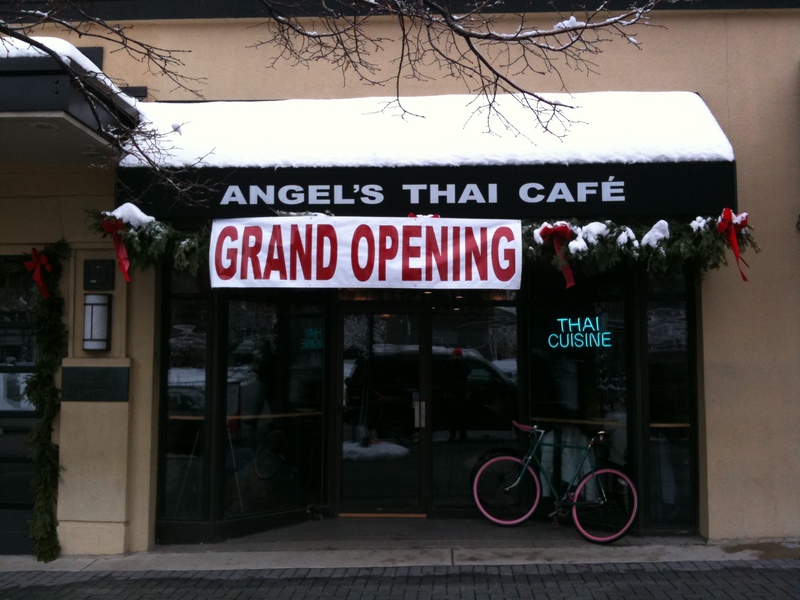 Angel’s menu features typical Thai fare (Pad Thai, Tom Yum soup, Gang Gai, etc.) as well as some new Thai-inspired originals. The average lunch will run around $7.00, while dinner entrée’s hover near the $12.00 mark. Late-night diners rejoice, Angel’s is open until 3:00AM on both Fridays and Saturdays. And, what’s more, it’s open on Sundays from noon to 9:00PM! Check out GR Grub's review of Angel's!